Interruttori automatici (1 + N Pole), marca Hyundai, per intensità tra 6A e 40A. Magnetotérmicos 1 Polo + Neutro. Magnetotérmicos (Polo+neutro), marca LSis (LG Industrial Systems), para intensidades comprendidas entre 6A y 40A. 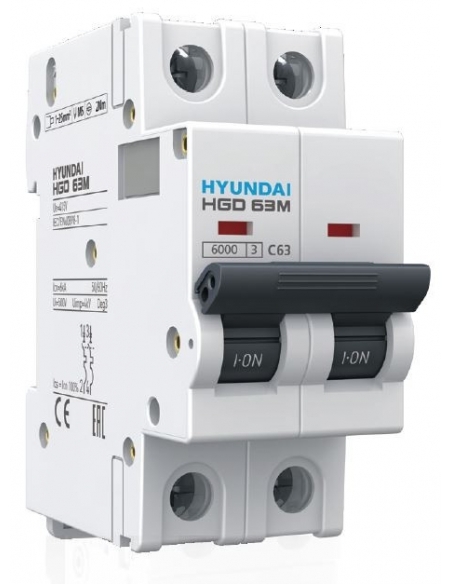 1+N Pole circuit breaker MCB of 6A for protection against short circuits and overloads in single-phase or two-phase installations. With an assigned cutting power of 6000A. Neutral located on the left side. 1+N Pole circuit breaker MCB of 10A for protection against short circuits and overloads in single-phase or two-phase installations. With an assigned cutting power of 6000A. Neutral located on the left side. 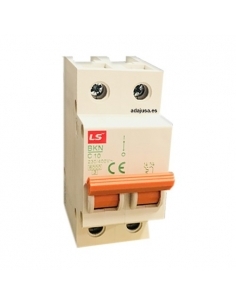 1+N Pole circuit breaker MCB of 16A for protection against short circuits and overloads in single-phase or two-phase installations. With an assigned cutting power of 6000A. Neutral located on the left side. 1+N Pole circuit breaker MCB of 25A for protection against short circuits and overloads in single-phase or two-phase installations. With an assigned cutting power of 6000A. Neutral located on the left side. 1+N Pole circuit breaker MCB of 32A for protection against short circuits and overloads in single-phase or two-phase installations. With an assigned cutting power of 6000A. Neutral located on the left side. 1+N Pole circuit breaker MCB of 40A for protection against short circuits and overloads in single-phase or two-phase installations. With an assigned cutting power of 6000A. Neutral located on the left side.